In the midst of a stressful life, losing yourself in an exhibition can be the ultimate form of escapism. As always, London’s cultural institutions have a huge amount to offer their visitors this year, from ambitious retrospectives of some of the world’s best-loved artists to intimate portraits of long-lost icons. We’ve rounded up some of the incredible London exhibitions you can look forward to in 2017. Heading off the year at The Whitechapel Gallery is Terrains Of The Body: Photography from The National Museum of Women in the Arts (18 January – 16 April). Subverting the narrative of the male gaze, this exhibition brings together the work of 17 contemporary artists, including Marina Abramovic and Anna Gaskell, to explore the female body as a medium for storytelling. Continuing on with the theme of the legacy of women, Dulwich Picture Gallery’s Legacy: Photographs by Vanessa Bell and Patti Smith (8 February – 4 June) will coincide with the Picture Gallery’s larger exhibition on the works of Vanessa Bell (sister of Virginia Woolf), bringing together images from two fascinating artists. In February, Kensington Palace will pay tribute to the iconic Princess Diana in Diana: Her Fashion Story (opening 24 February). Tracing the evolution of her fashion sense, which captivated millions from her first public appearance in 1981, this is a must-see for anyone with a preoccupation with the princess. One of the most significant exhibitions of the year is David Hockney at Tate Britain (9 February – 29 May) the most comprehensive exhibition (spanning six decades) of one of Britain’s most popular and influential artists. 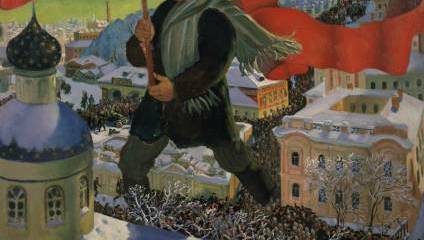 Finally delve into the rich artistic history of a particularly divisive country, Russia, in Revolution: Russian Art (11 February – 8 April) at The Royal Academy. The Russian Revolution was a hugely transformative time for politics and this is reflected in the art displayed here, with revolutionary expressions from artists such as Marc Chagall and Alexander Rodchenko. Spring brings with it an extensive and overwhelming selection of new London exhibitions. A particularly exciting one is Amy Winehouse: A Family Portrait (16 March – 24 September) at The Jewish Museum. Co-curated by Winehouse’s family and including some of her personal belongings, this exhibition gives an insight into the family life of a greatly missed and often misrepresented musical figure. Queer British Art (5 April – 1 October) also opens at Tate Britain, the very first exhibition to focus on queer art within the UK. From 1861 – 1967, this exhibition will examine how art represented the queer in society at a time when attitudes about gender and sexuality were changing. Over at The British Museum catch Beyond the Great Wave (25 May – 13 August), using the iconic Great Wave woodblock painting by Japanese artist Katsushika Hokusai as a springboard to focus on his work across three decades. The Rolling Stones were honoured in an extensive exhibition in 2016, and now it’s Pink Floyd’s turn with Their Mortal Remains (opening 13 May) at the Victoria and Albert Museum. More than just The Dark Side of the Moon, this exhibition will be an ambitious and spectacular audiovisual journey through the band’s entire career. Also opening at the V&A is Balenciaga: Shaping Fashion (27 May – 18 February 2018), a must-visit for any fashion enthusiasts as it will include never before seen couture gowns from this influential Spanish designer. In June, the Serpentine Gallery will dedicate their gallery to the work of famed British artist and commentator Grayson Perry with Grayson Perry – The Most Popular Art Exhibition Ever! (8 June – 7 September). The exhibition title gives you an idea of Perry’s acerbic commentary, exemplified in his boisterous and garish artwork. Finally the newly revamped Design Museum will present Breathing Colour (28 June – 24 September) by Dutch artist Hella Jongerius, an imaginative installation that examines how colour behaves with shapes, materials, shadows and reflections. Summer can be a quieter time for new exhibitions opening, but there are some very significant ones this season. Matisse In The Studio (5 August — 12 November) at The Royal Academy of Arts will take us into the studio of one of the world’s most popular artists, exploring his prized possessions and artistic process. Opening at the tail end of Summer is Basquiat: Boom for Real (21 September - 28 January 2018) at The Barbican Centre, the very first large-scale exhibition of American artist Jean-Michel Basquiat, a pioneer of the downtown New York art scene between the 1970s – 1980s. Make sure you also pay a visit to Soul of a Nation: Art in the Age of Black Power (July 12 – October 22) at The Tate Modern, a rare opportunity to see artwork from a pivotal time of social change in America. As one of the most important artists of the 20th century, The Royal Academy will turn their attention to Jasper Johns (23 September – 10 December) this Autumn in their main gallery, bringing together his paintings, sculptures, prints and drawings to explore his unconventional and experimental approach. Transporting us back to art in the middle ages through to the 19th century, Reflections: Van Eyck and The Pre-Raphaelites at The National Gallery (4 October – 2 April) will look at the lasting impact of Van Eyck’s Arnolfini masterpiece on Pre-Raphaelite artists Dante Gabriel Rossetti, John Everett Millais and William Holman Hunt. Wands at the ready in October, as The British Library premieres an undoubtedly extremely popular exhibition Harry Potter: A History of Magic (20 October – 28 February 2018). Presenting a thrilling display of wizarding books, manuscripts and magical objects alongside centuries-old British Library treasures, this is about as close to the Hogwarts library as we’re ever likely to get. Continuing on the theme of children’s literature, The Victoria and Albert Museum will take us into Hundred-Acre Wood for Winnie The Pooh – Exploring A Classic (16 December – 8 April 2018). See the manuscripts, drawings, letters and photographs that contributed to the creation of this world-famous children’s character.